Mention the name John Deere and the first image in most people's minds will be a green-and-yellow tractor. That's not surprising; Deere & Company is the world's largest manufacturer of agricultural equipment and one of the world's best-known brands. Undated photo of John Froelich. Courtesy of the Clayton County (Iowa) Historical Society. However, it might surprise you to learn that all those green tractors trace their lineage back not to John Deere, who died years before the company first put its name on a self-propelled machine, but to an inventor from Iowa who developed the first successful gasoline-powered farm tractor. Of course, it's quite likely John Deere himself was familiar with self-propelled traction engines, the predecessors of the modern farm tractor. If you've ever watched "Thomas the Tank Engine", Trevor is a steam traction engine based on a Foster & Rastrick model built in the first decade of the Twentieth Century. Building on the work done by steam transportation pioneer Richard Trevithick, Robert Ransomes of Ipswich, England, introduced a steam-powered traction engine in 1841 and began building them commercially a year later. This was about the same time a thirty-something John Deere was building up his plow business. By the late 1870s, not long after Deere had completed his term as mayor of Moline, Jerome Increase Case and his partners were building steam traction engines in Racine, Wisconsin. But early traction engines were slow to fire up, sometimes taking an hour to build up enough steam to operate, and mostly useless for farm work because they would bog down in fields. In addition, they were quite expensive. Improvements led to smaller and lighter engines but their appetite for clean water and coal was still quite large and they were still costly. As a result, farmers continued to work as they had for over a thousand years, guiding a moldboard plow with a horse, mule or ox providing the motive power. Of course, they now had Deere's self-scouring plow, so things were a little better. In 1849, a year after John Deere had moved his now-thriving company to Moline, Illinois, a German immigrant and his wife had a baby in a small town in northeastern Iowa. 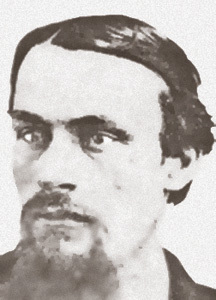 Johannes Heinrich Froelich had emigrated from Kuhrhessen, now part of the modern German state of Hessen, arriving in America in 1845. Finding good land in Iowa, he returned to Germany and brought another group of settlers to America. Among this group was Kathryn Gutheil, who became Heinrich's wife. Froelich Americanized his name to Henry and bought a small plot of land in Giard, about 100 miles north by northwest from Moline. The first of the nine Froelich children was John, born on November 24, 1849. He grew up to be a farmer, like his father, and lived in the nearby town of Froelich, named for his father. John's interests went beyond farming and he soon augmented his income by operating a grain elevator and running a threshing operation each fall in Langford, South Dakota. Fascinated by machinery, Froelich became very familiar with the steam-powered machines and their deficiencies. In addition, to the faults noted above, steam engines also presented a significant fire danger to the Midwest's windswept plains. 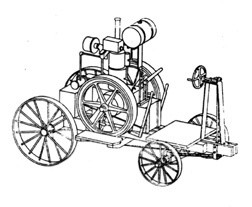 Drawing of Froelich's original tractor design. Unknown source. In 1890, about four years after John Deere's death, Froelich bought a gasoline engine from the Van Duzen Gas and Gasoline Engine Works of Cincinnati, Ohio, to power his grain elevator. Over the next two years, intrigued by the possibilities of the new engine, he experimented with the idea of making a gasoline-powered traction engine. In 1892, he mounted a single-cylinder Van Duzen on a Robinson chassis with a traction mechanism of his own design and produced a tractor capable of moving forward and backward and operating a thresher. That same year, Froelich and an assistant named William Mann hooked their new machine to a J.I. Case thresher and harvested 72,000 bushels of grain in 52 days, working in temperatures from below zero to a hundred degrees Fahrenheit. Inspired by his success, Froelich and a group of investors from Waterloo, Iowa formed the Waterloo Gasoline Traction Engine Company in 1893. The company built a total of four tractors, two of which were returned by unhappy customers. In order to stay in business, the company reorganized as the Waterloo Gasoline Engine Company in 1895 and focused on building gasoline engines for stationary applications, like powering grain elevators. John Froelich left the company the same year. Through Froelich was gone, the Waterloo company continued to work on applying gasoline engines to transportation uses. 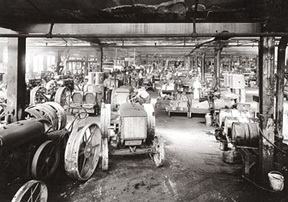 In 1902, the company reorganized one more time, merging with the Davis Engine Company to become the Waterloo Tractor Works with the idea of becoming a manufacturer of stationary engines and automobiles. Two years later, the marriage was over and the Waterloo Gasoline Engine Company was on its own again. But this time, they had a new product: the 1904 Waterloo Boy engine. Seven years later, they used it to power a practical tractor. Assembling model D tractors at the Waterloo Gasoline Engine Company, predecessor to the John Deere Tractor Works, August 1924. Courtesy of Deere & Company. By 1912, the company began producing Waterloo Boy farm tractors. The first official model, the LA, was introduced in 1913 and twenty were sold. The Model R was developed in 1914 and the company sold 100 the following year. By 1918, the year the Model R was discontinued, more than 8,000 had been sold. In the meantime, a second, larger model, the N, was added and by the company had decided to abandon stationary engines and concentrate on building tractors. The heyday of the farm horse was ending though it would not be until 1954 that tractors outnumbered horses and mules on American farms. In the meantime, Deere & Company was still on the sidelines. With their successful lines of farm implements, the officers of the company were reluctant to enter this new arena. The company tried developing their own designs, but none proved to be as good as those being built by Waterloo. By the time Deere shipped its first tractors to dealers, the company had decided to spend $2.2 million to buy their Iowa competitors. John Deere 7920 Tractor. Courtesy of Deere & Company. Copyright © Deere & Company. From 1918 to 1924, the John Deere Tractor Company continued to build the Waterloo Model N. It wasn't until the Model D made its debut that the John Deere name appeared on a tractor. It wasn't a bad way to start though; the Model D remained in production for many years and was extremely successful. But what about the guy who invented the first tractor? John Froelich married Kathryn Bickel and fathered two sons and two daughters but never seemed to be able to go back to his old life. He moved to Dubuque, Iowa, where he manufactured engines for Novelty Iron Works. He tried working for his brother, Gottlieb and was vice president of the Henderson-Froelich Manufacturing factory by 1910. Eventually he moved to St. Paul, Minnesota, where he worked as an investment counselor. His timing couldn't have been worse: the Crash of 1929 dealt a fatal blow to that profession. Almost broke, he spent his last years with his daughter Jenetie in St. Paul where he died in 1933. Years later, John Froelich finally received his due when he was inducted into the Iowa Inventors Hall of Fame in 1991. Deere & Company built upon the success of the Model D and over the years outsold or outlasted their competitors like Ford and Massey Ferguson and became almost synonymous with the term "farm tractor." I remember having a diecast John Deere toy tractor when I was a boy and, judging by the volume of replicas on the market today, there are lots of youngsters whose childhoods will also include a Deere. 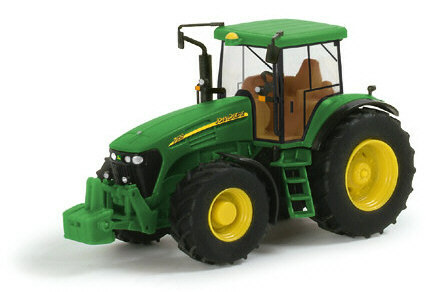 In a few days, Herpa will unveil its first model of a farm tractor, a John Deere 7920. (Photo of the Herpa Model shown at right) Unlike the Wiking 6920S introduced in August 2003, which is based on a European tractor built at the former Heinrich Lanz tractor works in Mannheim, the 7920 is an all-American machine sold in many nations but built only in Waterloo, Iowa. We've been asking for an American model from Herpa, now we have one. 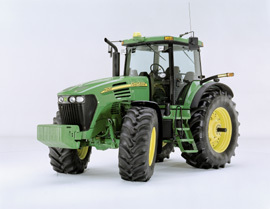 Introduced in August 2003, the 7920 is the largest of Deere's 7020 midrange agricultural tractor series. Equipped with an 8.1-liter turbocharged diesel engine from the larger 8020 series and an infinitely variable transmission, it has a maximum rear hitch lift capacity of over 19,000 pounds and 170 horsepower at the power take-off. Based on the information I received, the Herpa model will be nice but a bit on the pricey side. Look for features like steerable front wheels and positionable hydraulics. Between the new model from Herpa and those already available from Athearn and Wiking, it's going to be easy to have a nice John Deere dealership. Now all we need are some of the smaller tractors or a nice model of one of the John Deere Gator ATVs. Incidentally, Herpa's new tractor isn't the only new piece of farm equipment from an unexpected source. Busch has also announced a new tractor. This one is strictly German - it's an IFA Fortschritt ZT300. The ZT300 was a 100-horsepower, 2-wheel drive tractor produced in East Germany from 1967 to the fall of the German Democratic Republic. The new 7920 is just one of the interesting new items coming from Herpa in the next few months. I am looking forward to seeing what else Herpa has in the works. By the time my next column comes due, the Nuremberg Toy Fair will be over and we'll have a better idea of the treats 2006 has in store.